The version of pizza that we know (and love) today was invented in the late 18th century in Naples, when some GENIUS decided to add tomato sauce to focaccia. And we all lived happily every after. The Margherita pizza was apparently named after the Italian Queen of the same name who, upon a royal visit to Naples in 1889, was served a pizza topped with chopped tomatoes, mozzarella, and fresh basil. Italian immigrants brought their culinary treasure around the globe, and with it, a thirst for their brisk, savoury, dry red wines. For nothing pairs better with pizza than Italian wine! But with an estimated 2000 different grape varieties grown in this viticultural paradise, how do you choose what to drink on pizza night? Match like for like: if you are throwing a frozen pie in the oven, or ordering in from a large chain, don’t waste money on a fancy bottle. Pair to the level of complexity of the food. There are lots of great 15$ wines out there that will do the trick nicely. Acidic foods require crisp, lively wines: tomato sauce is high in acidity. A low acid wine (as can be the case with big, jammy, hot climate reds) will seem flabby in comparison, lacking vibrancy and brightness. Rich foods can be tempered by higher acid wines: melted cheese is delicious, but can be a little too heavy. Pairing cheesy pizza with crisp wines can cut through the fat, facilitating digestion. Just think how well lemon and butter compliment each other in seafood sauces. Avoid big, tannic reds, unless your pizza is loaded with meat: tannins create a sensation of dryness (or astringency) on the palate. When tannins are ripe, this feeling can be quite pleasant – ranging from subtle to pronounced (in fuller-bodied wines) – giving structure to wine. Big tannins, however, require meat. Tannin binds with the proteins in meat, intensifying its rich, savoury flavours, and softening the wine. Beware heavily oaked wines: wood, just like the skins and stalks of grapes, contains tannins. New oak barrels can impart tannin to wines, making them firmer and drier on the palate. In honour of superbowl Sunday, the husband and I ordered a big, cheesy, all-dressed pizza (pepperoni, peppers, mushrooms and olives). We decided to try out our pizza and wine pairing theories with a little taste test. We lined up the usual suspects and gave them each a swirl. What we thought: Classic food and wine pairings exist for a reason! Guillaume and I both declared this the clear winner. The acidity was perfectly pitched, cutting through the grease with ease. The fine tannins worked well with the pepperoni. Both wine and pizza tasted better when served together. Handy tips: Chianti has a quality hierarchy that starts with basic Chianti (often light in body, very crisp, with marginally ripe fruit, and moderate, grainy tannins). Chianti Classico comes from a specific sub-zone in the heart of the appellation. The grapes here tends to ripen more fully, producing wines with more body, greater aromatic nuance, and highly concentrated fruit flavours. You may see mentions like “Superiore” or “Riserva” on the label. These terms have to do with ageing periods in cellar, and fruit ripeness. They are an additional guage of quality : Superiore (minimum 1 year ageing, minimum 12% alcohol), Riserva (minimum 2 years’ ageing, minimum 12.5% alcohol). Why we chose it: Barbera d’Asti hails from the Piedmont region of north western Italy. The wines often have bright, tangy acidity, medium body, vibrant black cherry fruit flavours, and soft to moderate tannins. What we thought: This pairing was a hit, and would certainly be the best choice for wine drinkers preferring fruitier reds. It also showed the best when we added hot chile flakes to one slice. The sweetness of the fruit counterbalanced the spicy heat nicely. Handy tips: The grape variety is called Barbera. Asti is the name of the area (within Piedmont) where it grows. There are also delicious Barbera wines from neighbouring vineyards that would be a good fit. Look out for appellation names like Barbera d’Alba or Barbera del Monferrato. Why we chose it: The Montepulciano grape, grown in the region of Abruzzo in south eastern Italy, produces wines that are deep in colour, with fresh acidity and medium body. They are fairly earthy, with ripe blackberry, cherry, and herbal notes. Tannins range from only moderately firm to quite markedly “chewy”. What we thought: Our 15$ bottle worked reasonably well. The earthy flavours underscored the mushrooms nicely, and the fresh acidity evenly matched the tomato sauce. The tannins were just a shade too astringent for this pizza however. A meatier pie would probably suit this wine better. Handy Tips: Confusingly, there is an appellation in Tuscany called Vino Nobile de Montepulciano. Wines from this vineyard area are made with Sangiovese, and have nothing whatsoever to do with Montepulciano d’Abruzzo. Why we chose it: Literally translated, this means Tuscan red wine. These wines can come from vineyards planted virtually anywhere in Tuscany. They usually feature Sangiovese, and often have high proportions of international grape varieties such as Cabernet Sauvignon and Merlot in the blends. They can be very refreshing, in an approachable, easy-drinking, fruity style with ripe, rounded tannins. What we thought: Despite having chosen a 2015 vintage (which was quite a warm, ripe year) this specific wine was very tightly knit, verging on austere. The pizza made the wine seem overly firm and astringent. Overall, an unsuccesful match. Handy Tips: Rosso is a term used in some of Tuscany’s top appellations to designate simpler, earlier drinking styles of wine. Where Rosso di Toscana IGT wines are often blended with tannic grapes like Caberenet Sauvignon (which is where our error potentially lay), Rosso from top appellation: Montalcino is 100% Sangiovese. Montalcino lies due south of the Chianti region. The wines are similar stylistically, but are riper in fruit and fuller bodied. Alternatively, Rosso di Toscana wines with a high percentage of Sangiovese, and blending partners like softer, rounded Merlot, would potentially also work well. Why we chose it: From the Veneto region, in Italy’s north east, Valpolicella is a blend of indigenous grapes: mainly Corvina, Corvinone, and Rondinella. Basic Valpolicella (Classico) wines tend to be light in body, fresh, floral, and vibrantly fruity (red and black fruits), with soft tannins. Ripasso versions are richer, and more concentrated, due to the process of adding the raisined grape pommace, left over after Amarone fermentation, to steep in the just fermented Valpolicella wine. This technique raises the alcohol levels, gives sweeter fruit flavours, and a fuller body. What we thought: We should have stuck to Valpolicella Classico. The Ripasso, while delicious, was too rich, too sweet, and too big a wine for the pizza. It completely overpowered the food. Handy Tips: Basic Valpolicella, served slightly chilled, would be a good choice for a simple pizza dinner. If you are serving gastronmically styled pizza, and wanted a similar profile, Valpolicella Superiore offers greater nuance and complexity. Superiore wines are aged for a minimum of 1 year prior to bottling. So there you have it! 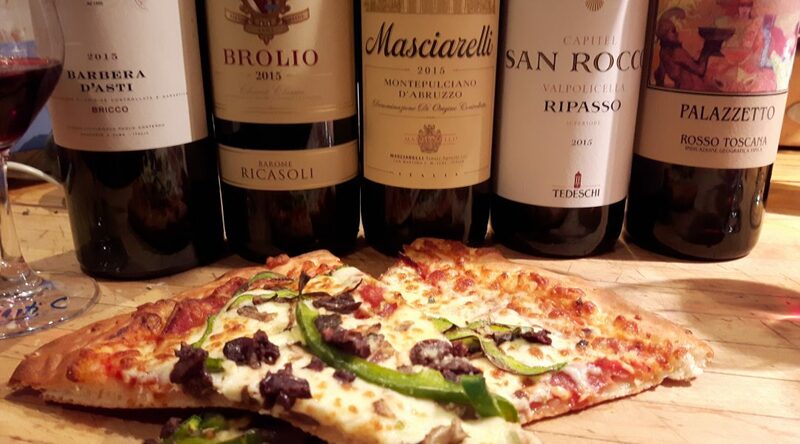 With all these new wines to try, you may need to make pizza night a weekly occurrence. Looking for something a little out of the ordinary? Why not try a dry Lambrusco? These lightly sparkling red wines from the Emilia-Romagna region are lively and fresh, with tangy red fruit flavours, and savoury nuances. Be sure to check for the mention “secco” (dry) or “semisecco” (just off-dry).